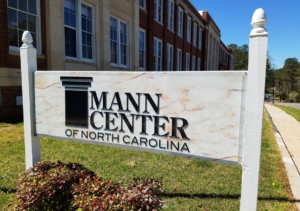 A fondly regarded school building for its first half-century of existence, the Mann Center of North Carolina now serves as the Arts and Community Center of Lee County. Within its historic walls you’ll find a 300-seat auditorium, where various community theater events and and other productions are performed; as well as over 25 offices, a conference room, and a multi-use room for parties & Events. All of our spaces, including our auditorium, are available to rent at affordable rates. In addition to housing quality office and meeting spaces, the Mann Center serves as the home of various noteworthy Sanford and Lee County non-profit organizations such as the Salvation Army and the American Red Cross. As an engaged supporter of the community, the Mann Center is also a champion of the local art and artists of Lee County. In 2018 the Mann Center became the on-site host and primary benefactor of the Sanford Arts & Vine Festival! And every time you walk into the Miller Art Gallery, you’re sure to experience a variety of art created by local and regional artists. For more information about the Mann Center or any of our resources, facilities or events, please don’t hesitate to contact us at 919-775-5273 , by email at lcacc507@gmail.com, or by filling out our online form.